Hon Speaker, the Democratic Alliance wants to, without any vagueness express its dissatisfaction in the dysfunction displayed by the Department of Education as summarized in the general findings of the adopted annual report of the multiparty portfolio committee on education. What is clear in the report presented here today is that there are no adequate systems in place to identify and disclose all irregular expenditure incurred during the year under review. There is a persistent volatile environment in the department of education, resulting in perpetual leadership instability, absence of personnel in key leadership positions and a negative climate and culture, which impacts adversely on the work ethic of the department. The culture of the Department of Education is equivalent to a very unsafe environment. Even those that want to work, the environment doesn’t allow them to flourish. The question that needs to be posed is the following – to what can this culture of an absence of a work ethic, non-commitment and non-consequence management be attributed to? Is it political, labour orientated or is it related to management issues. Hon Speaker, if there is a delay in addressing these adverse contributories, then this government of the ANC must be held responsible for the demise of a once efficient and effective department of education. 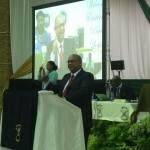 Hon Speaker, according to the department’s own education management and information systems, of which I have a copy, there was an increase in learner enrolment in public ordinary schools in the Eastern Cape to 1,894 million in 2015, yet the Hon MEC for education thought it to be appropriate to have less educators in the system. The Democratic Alliance’s vision for the future is that education in the Eastern Cape must be improved to enable younger South African’s to take advantage of opportunities. To achieve this, we need a system that is free from teacher shortages and overcrowded classrooms. Hon Speaker, let us analyse the implications of the decision to cut the post basket for 2016 by 1049 educators. Schools have already indicated a number of them have been adversely affected by the pre-final staff establishments in that some of them are losing between four and eight teaching posts. Yes, these are schools within my constituency, and I am not shy to tell these schools who are responsible for their decreased number of teaching posts. Hon Speaker, the Hon MEC responsible for education has indicated that he was cutting teacher posts in order to provide quality education. The Hon MEC for education has also indicated that it is not about the number of teachers in the system, but the quality thereof. Hon Speaker, we already have more than 2800 vacant posts in this province, it might even be more, because in our general findings there is a finding that alludes to information provided by the department that lacks integrity, it is inaccurate in many instances, unreliable, incomplete and for certain instances, even non-existent. This department is going to create on top of the 2800 vacancies, another 1049 vacancies, which will most certainly result in overcrowded classrooms to the extreme. Even if the department provides mobile classrooms, of which I doubt, because of the lack of capacity due to the absence of technical staff within the Infrastructure Directorate, to prevent overcrowding, there will unfortunately not be enough teachers at schools because of the forced rationalization of teachers. The moral and psychological impact, come next year will be indescribable when teachers, where posts have been reduced, will have to be identified to exit the system if there are no suitable posts for them to fill. These are the realities that are facing the 2016 school academic year, and this is the type of quality education that is being envisaged when the post basket was decreased. Hon Speaker, the Democratic Alliance does acknowledge that more children have access to education in the Eastern Cape. Out of the 1.89 million learners that attend our 5554 public ordinary schools, 1,599 million of these learners do not pay any school fees and 1,745 million are on the school nutrition programmes. These achievements are commendable, but how do you satisfy the child’s educational hunger when there is not a teacher in each and every classroom, due to the decrease in substantive vacancies, and due to the inability to fill critical and scarce skills funded posts. Hon Speaker, the Auditor General has provided the following findings with regard to the leadership, governance and administration of the department in 2014/15. There is poor management of teachers’ vacancies with recurrent over expenditure due to excess teachers, poor management of delivery agents for infrastructure, a third of schools with less than 135 teachers that are not viable, lack of effective district support to and monitoring of schools, and the highest learner drop-out rate in the country, are inefficiencies that characterises the province’s education system. Not a good story to tell. The only good story is the universal access of 1, 89 million learners to education with certain educational and humane provisions to attract and retain them in the system. Hon Speaker, I’m glad to hear that the ruling party is going to instruct those in government to start the process of designing a policy to have school inspectors appointed. This is long overdue. I sincerely hope that all modalities will be finalized sooner than later with regards to the processes of planning and budgeting. Hopefully the current change fatigue within the department will adapt to renewals and improved systems that will benefit our learners. There are still systemic challenges and resistance to change. The Democratic Alliance beliefs that this change to be given time – we are aware that mistakes will be made in the process but let us enfold the change with regard to school inspectors – it is in the best interest of our learners and the schools in particular. Hon Speaker, I am aware of the fact that parents have a right to send their learners to schools of their choice. I am also aware that some parents especially in the townships of Port Elizabeth do this at a high financial price and sacrifice. Why then Hon Speaker do we have such a high migration of learners to other areas beyond the townships of Port Elizabeth to access quality education. This Hon Speaker, has resulted in a multitude of underutilized and abandoned schools with underworked educators. Why then don’t we have the same migration patterns in the other areas of Port Elizabeth? This dwindling learner numbers in township schools is a grave matter of concern. Hon Speaker, we cannot just accept this migration as the norm, because it is not. There is something wrong with schooling in certain areas and I will appeal to communities to mobilize themselves to ensure that they participate in the schooling of their children, particularly in the township, and the appropriate district should engage with all education forums and stakeholders to turn the situation around. Hon Speaker, the Department of Education in the Eastern Cape should be commended for allowing teachers to invigilate matric exams at neighbouring schools. This is one model to strengthen the credibility of the matric exams. In the last matric exam in the Eastern Cape it was established that invigilators/teachers at certain schools orchestrated irregularities, therefore this action taken is deemed appropriate. The Democratic Alliance also wants the department to consider utilizing the services of parents who have the necessary acumen to be appointed as investigators with an agreed upon stipend as compensation. This will, if implemented, cleanse our matric exams of irregularities. Hon Speaker, the Democratic Alliance hopes that the 13927 learners that have progressed, and not promoted from Grade 11 to Grade 12 is 2014, have been assisted in their preparation for the 2015 matric examination, because these are the learners out of the 91810 that have not successfully completed Grade 11 and might have a negative impact on the final results. The DA’s wish is that all of our learners are successful in this examination.